A flexor pronator strain of the elbow is a common source of pain in the elbows of pitchers. The pain is located on the medial side of the elbow (the inside of the elbow closest to the body). 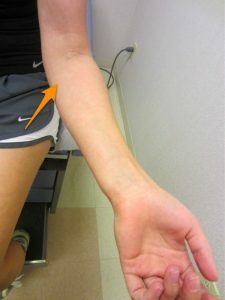 There are many causes of pain on the medial side of the elbow in pitchers and other throwing and overhead athletes, such as medial epicondylitis (“golfer’s elbow), ulnar neuritis or ulnar nerve compression, and ulnar collateral ligament injury. Therefore diagnosis of this injury can be difficult. A flexor pronator strain can either result from an acute event or can develop as a result of overuse. A pitcher who has an acute flexor pronator strain will remember a specific throw where he felt sharp pain on the medial side of the elbow. His pain will usually be located just past the bony prominence on the inside of the elbow. He often will have pain flexing the wrist or pronating the forearm. The flexor pronator muscle are a source of medial elbow pain in throwing athletes. Note the location of the flexor pronator origin (orange arrow). Evaluation by a sports medicine physician is important soon after the injury to try to determine the correct diagnosis quickly. X-rays are usually normal with this injury. In high-level athletes an MRI is often ordered to ensure that the pain is not coming from an underlying injury to the ulnar collateral ligament, also known as the Tommy John injury. Most of the time, a flexor pronator strain is treated with rest from pitching for several weeks to give the tendons time to heal. Ice and physical therapy can also be helpful to decrease the athlete’s symptoms. As the pain improves, the pitcher will be started on a long toss program prior to returning to full pitching.